Kerrick has shot more than 200 magazine and book covers for publications like NG Adventure, Alaska, Arizona Highways, Sunset, and Virtuoso Life since 1984. All were shot with Pentax SLR's and lenses. He started with the Pentax ES in high school, and has used all Pentax optics since then in his career. 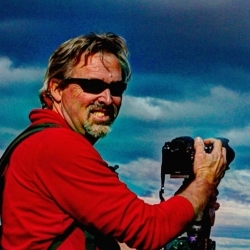 A 1982 graduate of Arizona State University, he earned a BFA in Photography. Specializing in editorial travel imagery, he shoots all aspects of active adventure and destination travel. He is represented by Getty Images, Corbis and Alamy, and also markets his stock images personally, and thru AgPix.